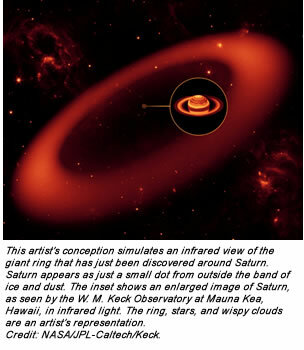 NASA’s Spitzer Space Telescope has discovered an enormous ring around Saturn — by far the largest of the giant planet’s many rings. The new belt lies at the far reaches of the saturnian system, with an orbit tilted 27° from the main ring plane. The bulk of its material starts about 6 million kilometers (3.7 million miles) away from the planet and extends outward roughly another 12 million kilometers (7.4 million miles). One of Saturn’s farthest moons, Phoebe, circles within the newfound ring, and is likely the source of its material. “This is one supersized ring,” said Anne Verbiscer, an astronomer at the University of Virginia, Charlottesville. “If you could see the ring, it would span the width of two full moons’ worth of sky, one on either side of Saturn.” Verbiscer; Douglas Hamilton of the University of Maryland, College Park; and Michael Skrutskie, of the University of Virginia, Charlottesville, are authors of a paper about the discovery to be published online tomorrow by the journal Nature. The discovery may help solve an age-old riddle of one of Saturn’s moons. Iapetus has a strange appearance — one side is bright and the other is really dark, in a pattern that resembles the yin-yang symbol. The astronomer Giovanni Cassini first spotted the moon in 1671, and years later figured out it has a dark side, now named Cassini Regio in his honor. A stunning picture of Iapetus taken by NASA’s Cassini spacecraft is online at photojournal.jpl.nasa.gov/catalog/PIA08384. Saturn’s newest addition could explain how Cassini Regio came to be. The ring is circling in the same direction as Phoebe, while Iapetus, the other rings, and most of Saturn’s moons are all going the opposite way. According to the scientists, some of the dark and dusty material from the outer ring moves inward toward Iapetus, slamming the icy moon like bugs on a windshield. The ring would be difficult to see with visible-light telescopes. Its particles are diffuse and may even extend beyond the bulk of the ring material all the way in to Saturn and all the way out to interplanetary space. The relatively small numbers of particles in the ring wouldn’t reflect much visible light, especially out at Saturn where sunlight is weak. “The particles are so far apart that if you were to stand in the ring, you wouldn’t even know it,” said Verbiscer. Spitzer was able to sense the glow of the cool dust, which is only about 80 Kelvin (–316°F). Cool objects shine with infrared, or thermal radiation; for example, even a cup of ice cream is blazing with infrared light. “By focusing on the glow of the ring’s cool dust, Spitzer made it easy to find,” said Verbiscer. These observations were made before Spitzer ran out of coolant in May and began its “warm” mission.